The Indian auto-rickshaw is a familiar sight on Indian city roads. It provides a convenient way to get around which is cheaper than a taxi and quicker than the bus. But this convenience can also be a hassle. 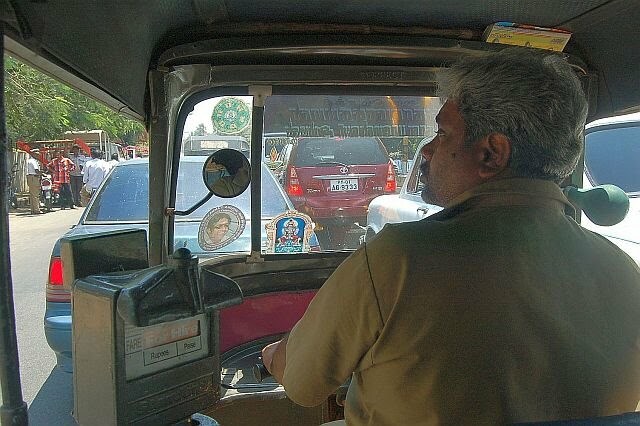 Auto drivers are not very popular because of their tendency to take passengers for a ride (pun intended). Bangalore auto-drivers are relatively tame compared to those in Chennai – where total auto anarchy prevails – but they can be a challenge to deal with. Often they don’t want to use the meter and quote you an inflated fare instead. Or meters are tampered and run faster than they should. Sometimes they try to take a longer route, citing traffic problems or any other excuse they can come up with. Or they just don’t want to go where you want to go. Try to take an auto into the city centre during rush hour and before you’ve finished telling the driver your destination he will speed off leaving you on the road coughing in a cloud of auto exhaust. Recently, fed up auto-riding citizens decided to no longer take no for an answer. A day-long action dubbed Meter Jam was organized and citizens were incited to boycott autos for a day: Say NO to auto-rickshaws on 12th August. Because they say NO to you whenever they want. Recently I was in an auto with a chatty driver who spoke English. I asked him what he thought of Meter Jam day and he replied that he thought it was a good idea and that people should not put up with dishonest drivers. He also told me that he found the recent fare increase too high and that more people may now decide to take the bus instead of autos. I was surprised as much by his opinions as his fluent English. He told me that he’s been driving an auto for a year. He used to have a nut-and-bolt-making business but it didn’t go well. So can auto-drivers make a decent living? I asked him. He told me his take-home pay at the end of the day is 550 rupees. If he works a 6-day week, he earns over 13,000 rupees (220 EUR / 180 GBP / 292 CAD / 279 USD) a month. This is much more than the average salary of a private driver. He makes more on Saturdays because he waits near pubs and nightclubs at night after they close and when fares increase by 50% after 10pm. He told me that few auto drivers own their own vehicles. A new auto costs 160,000 rupees and few can afford this. They rent them on a daily basis from their owners (who apparently own whole fleets of autos) for 150 rupees per day and 100 on Sundays. Besides the daily rent he pays about 200 per day for fuel. And what will happen when the metro opens? Will autos be in less demand? Mr auto-driver is optimistic. He said that autos will provide a shuttle service to metro stations. They can charge 10 Rs each way for each passenger on a share-auto basis, like in other cities. This will mean good business for them. As for Meter Jam Day, it was not much of a success according to the papers. But the organizers are pledging to make this a monthly event! Haha! Actually he volunteered most of this info! I had asked him if he was the owner of his auto and then he explained the whole system to me... like I said, he was very talkative! Hey Isabel, happened to visit your posts. Interesting..gives me a different perspective of my own country and its people. Glad that you are enjoying it here. Keep on writing.